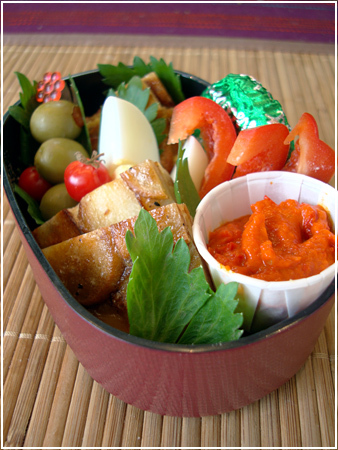 Big box: Potato tortilla on lettuce, cherry tomato decoration. 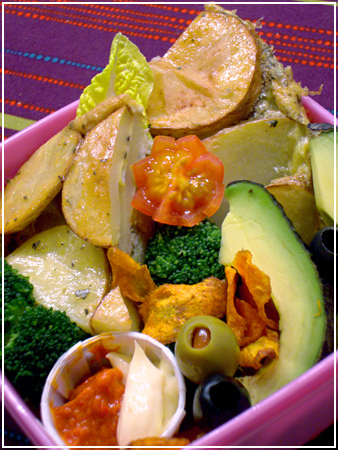 Small box: Broccoli, carrot chips, ajvar and mayo, olives and avocado. BF gets the same in the square HK box. 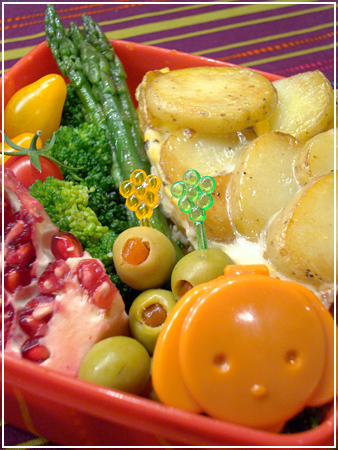 Spanish Tortilla, Asparagus spears, broccoli, pomegranate, cherry tomatoes, olives and (I needed a last-minute injection of cute) a dog container with Ajvar. 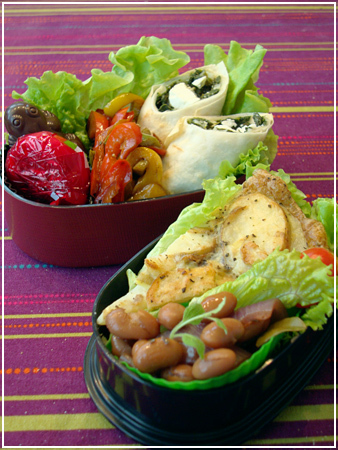 I did some other bentos this week but I didn’t get around to post them. They weren’t particularly interesting, anyway. This one on the other hand is stuffed with yummy food – and since it’s all leftovers, it was easily assembled! Front: Spanish potato tortilla, pickled beans and onions, cherry tomato. 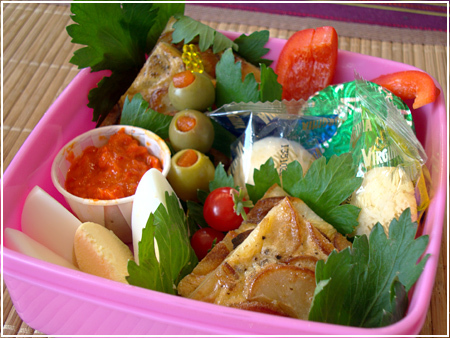 I haven’t had a Spanish tortilla in my bento in ages! Maki of Just Bento reminded me of it. The feta and spinach rolls are really easy. I bought dough for it, but you can just use some sheets of phyllo dough cut into triangles as well. Just cut a stick of feta, cover it in spinach (I thawed whole leaf spinach from my freezer – if you use fresh parboil them so they wilt and press out the water), then roll the feta-spinach roll up in the dough triangle. Deep-fry or ovenbake sprayed with a little oil (like I did). For pickling the onions and beans, caramelise 4 Tsp. sugar in a pot. Add a cup of wine, 4 Tsp. balsamic vinegar, some water, a bay leaf, a sprig of thyme, and the beans and onions of your choice (the cookbook called for giant white beans and whole shallots, neither of which I had, but borlotti beans and quartered red onions worked just as well) and simmer for at least 20 minutes. Salt and pepper to taste and keep in a jar in the fridge. Serve as-is or add a little olive oil on top before serving. All I can say is YUM. Oh, right. There’s aioli and Ajvar in the little condiment cup (which I sneakily took from the local burger chain’s stash). Ss_biggie reminded me how much I loved Ajvar, so I grabbed a glass at the supermarket the other day. And since I like hot stuff (and can handle it), of course I took hot. Luckily ever-paranoid, I had taken some pictures with my regular camera too. But they don’t look nearly as good as the SLR ones as I’m already able to tell! Oh well, I guess I’ll be taking pictures in parallel for a while until I have it figured out. Main course: Spanish potato tortilla on a bed of salad. Black garlic olives. Side dish: Cherry tomato salad with red onion and fresh basil; green garlic olive. Dessert: Freshly-picked forest berries on yoghurt, all frozen to serve as ice pack (this goes back into the freezer until tomorrow). Today I went to the forest in search of mushrooms. I didn’t find any yet, although the weather was perfect – I guess there were too many mushroom pickers before me! 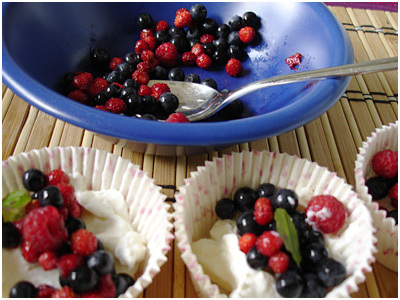 – but I did find an abundance of wild raspberries, forest strawberries and blueberries. I’m especially happy about the forest strawberries (or smultron as they are called in Swedish) because they taste so much better than the giant strawberries you can buy in supermarkets. 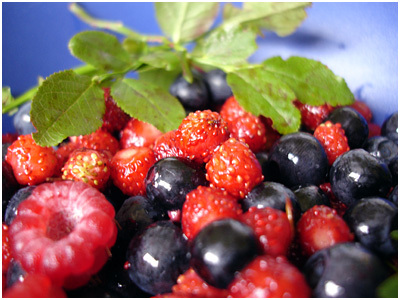 Talk about a taste explosion in every single, tiny berry you pick. I had a hard time picking any for later and not putting every berry in my mouth immediately! It is no coincidence or photographic accessorizing though that amidst all the berries, there is also a flower. 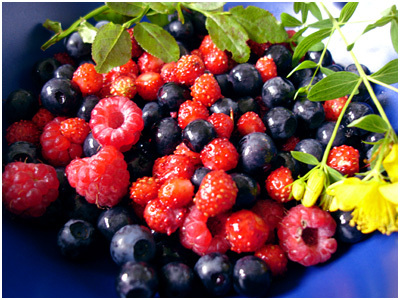 When I went out to the forest with my grandmother, we did not only pick berries and mushrooms! The yellow flower giving such a pretty contrast to the red and blue berries is called St. John’s Wort or in German, Johanniskraut and can be used dried as a tea, or steeped in alcohol as an antibiotic tincture that speeds up wound healing. It is rumoured to be good against mild depressions even! I love Spanish tapas. While I can’t eat all of them, there’s always something lovely and savoury for me in it. And when I feel blue and don’t know what to eat/cook, tapas are the perfect food to nibble! Colourful, savoury and delicious. A little here, a little there, toss in a salad or a caprese or some cheese (I like parmesan/grana which is just parmesan by another name) and bread and you’re set! Olives – whenever I manage to get to an ethnic foodstore, I buy a big pint of fresh olives to bring home. The supermarkets here only have either canned olives or very oily ones – I prefer them marinated in brine with herbs. Shown here are green and black olives marinated with garlic and lemon. Garlic grilled prawns – I don’t need to put a recipe here, right? * Cut bell peppers into about 1cm wide strips. If you take three different-coloured bell peppers it will look even better – I only had yellow bell pepper at home, sadly. Peel a garlic clove and slice or quarter it. * Heat a few spoons of olive oil in a deep pan. Fry the bell peppers with the garlic until they start to become soft, but still have a crunch. * Take the pan off the heat, then pour in balsamico vinegar – enough to quench the heat. Cook a little, remove the garlic and add salt and pepper to taste. Serve warm or cold. This is a very good way of using up leftover cooked potatoes, but delicious on its own as well! I don’t add anything to the omelette other than potatoes, eggs and salt/pepper, but you can vary the recipe by adding vegetables or spice it up with onions and garlic. * Slice the potatoes into 0.5cm wide discs. * In a bowl, scramble eggs (I used 4 for my pie, take more or less depending on the size of your pan and grade of hungriness) with salt, pepper, and whatever other spices you like. * Take an ovenfast pan or pie form and spray it with olive oil. Put down a layer of potato slices on the bottom, not overlapping. * Pour some of the egg mixture over the potatoes to cover them, spread it out with a spoon so the potatoes are covered by a thin layer of egg. * Repeat until you run out of either potatoes, egg or pan. * Put in the oven at 200 degrees and bake until the egg is no longer runny and nicely brown on top. 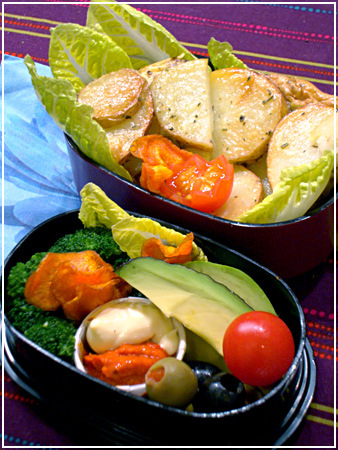 Cut into wedges and serve warm or cold. Voilà! Or maybe, Olé!